Brain Octane Oil, when encapsulated, slows the digestion of Caprylic acid and spends more time in your gut, balancing beneficial bacteria and helping maintain normal yeast levels. Studies have shown that Caprylic fatty acids have gut biome balancing and potent microbial balancing effects that help to support healthy digestion and immune function. 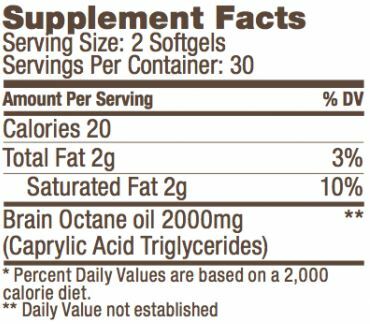 Caprylic Acid Triglycerides from highly refined Coconut Oil (Brain Octane Oil), Bovine Gelatin, Glycerin, Purified Water. Take 1-2 capsules with food for gut health. Take 1-2 more capsules as desired for energy.